I made a thing: The Season Journey Tracker! Super simple concept - just as you doing the Season Journey click on a task to keep an overview of what you have done and what still needs to be done. The status is saved in a cookie. Pay attention to the in-game popups because you can complete many season journey objectives that aren't even visible yet, so this website might help you to keep an overview. Where is the stash tab? Do you have information about class specific sets for Season 7 from Haedrig gift? Thank you, this is really awesome! Just one small issue: would be nice if it were optimized for small devices (I could help you, if necessary). All my tools are designed for desktops... but I see your point. Do you have any general guidelines for how to transform it? In general I'm not a fan of unified designs (Blizzard is going down this route with the forums and it's the worst thing ever, it'll kill the D3 forums for me entirely). I think I'd rather create a separate mobile version... but since I've never done mobile website development I don't know where to start. Any advice welcome, sure - though I can't promise I'll have the time though. The chart is really well done my thanks & props go out to you Bagstone! Yeah on phone you would have 2 columns visible at most. But that defeats the purpose of having everything visible at a glance, at least that's what I had in mind ;-) If I were to turn this into an app (which I'm not doing) you could obviously swipe between difficulties and make a different activity for each difficulty. Hm. Hmhmhmhm. Will think about it, but currently can't think of a good solution that would make me happy. 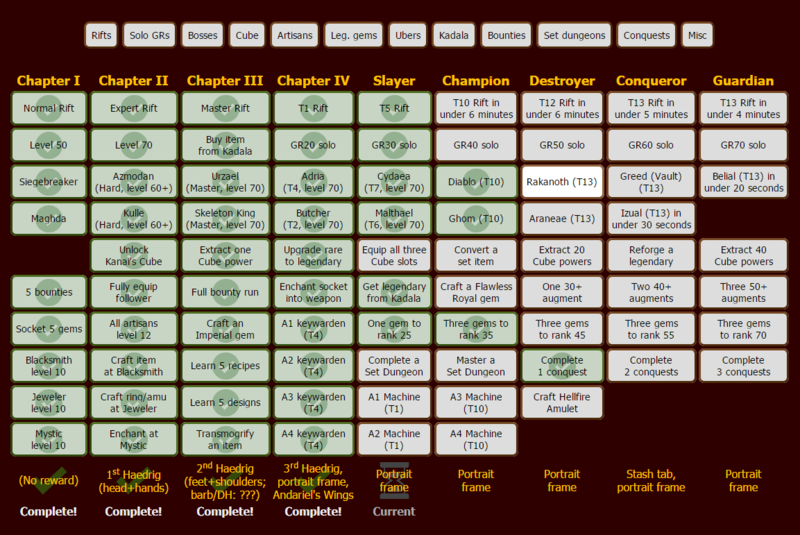 For completeness sake you can also add the Conquests? Not really necessary though, but just in case you wanna cover everything. I think the issue is less of technical nature but more how to deal with the scarce screen real estate on mobile devices, as we discussed before. I'm very open to discussing this here though, so suggestions welcome. I mean an easy cop-out way might just be to make a looooooooong scrollable list of all objectives... but that's neither good usability nor does it resemble the idea of a season journey overview. Maybe adding the actual conquests when clicking the Conquests highlight would be a nice feature. Like an additional row appearing next to Guardian or similar, also with this click-to-mark-as-solved feature. If the full text is too long, display only full text if hovering over a single conquest "cell". That's an interesting idea - yeah, I'll think about it. Though it "hides" the conquests... but I could add it to the description. Hm... yeah, might work! Hey Bagstone. This journey tracker is really awesome. Been loving the guides/info you been posting lately. Always makes for an interesting read. Keep up the gook. Wondering if you got more info on that last point you made about leveling using the massacre bonus in solo mode. I'm really torn this season between leveling solo vs group. Solo looks so fast but also don't wanna gimp myself once I hit lvl 7 and delay my 2piece gift. I read somewhere it cost 186,000 gold to upgrade the blacksmith to lvl 10. Does it cost the same for the jeweler and the mystic? By leveling using the massacre bonus, roughly how much longer will it take to get enough gold to lvl all the artisans to lvl 10? 1) Doing a Vault; 2) Finding a Gilded Baron; 3) Doing rifts pre-70. We've tested everything (even a complete bounty run pre-70) and nothing gives you enough gold besides those three things to level all artisans at 70. Massacre only is fast, but it comes with the drawback of being undergeared most of the time, definitely not having enough gold to craft the "level requirement reduced" weapons at 42/61, and the big thing is that I personally think the servers will crash based on the fact that so many people will constantly re-create games because some guides recommend to only run area. (Which is not true btw, you can get massacre bonuses in every area and you don't need to get it up to 400 every time, even with not getting a single massacre bonus over 200 you can still be at 70 quite fast). And it takes quite some effort as well, whereas rifts is a no-brainer. Also, keep in mind that this is a game about having fun, and being forced to play solo and leave your friends behind is not fun in my book, so if they want to do rifting why not? In the end being level 70 after 2 hours or 2 hours and 30 minutes doesn't make a difference. By Sunday it's not about who had the best 1-70 strategy but who had the best drops (and the least sleep), so don't go crazy over this. Up until I saw that bullet point this morning I was convinced I was going to level using the massacre bonus. I had even been practicing chaining together some big bonuses with fresh chars. But your insight into it has definitely left me thinking. You bring up some great points about recreating games continuously affecting servers, amount of effort to keep the massacre bonus going, how much gold you get and prob most NB, about having fun. I'll also take the other things into consideration - not sure I'm gonna re-visit all the code of my existing tools, but definitely in the future. Also yes @indentation, I'm trying to use it whenever possible (looking at my code I thought I did, but I guess you can always improve). I haven't heard about the "responsive design" movement yet, but it sounds like it would require me to rethink my entire approach to designing menus and stuff. Will keep an eye on that for when I have more time, doesn't look like something I can implement on the fly. Again - thanks for all the pointers, very helpful! I'm always interested in learning how to improve those things (though I know I'll never be perfect, for that I'd have to invest more time than I have at my disposal). You are more than welcome. My first web-class was also many years ago (about 15, I think), and even though I've learned quite a lot over the years, there's always room for improvement. You Mr. Bagstone, are awesome! Thank you! Yep fixed it already, along with a ton of other things. Just one more thing and then I'll push it.